Have you ever heard of “guff?” What is guff? Why should Christians know about it? The word “guff” or sometimes spelled “guf” is not what this article is about. It’s not about language but about mythological beliefs. The word “guf” is transliterated from the Hebrew word “guph” or “gup” and literally means “body.” In Jewish mysticism or mythology there is a “Chamber of Guf” called the “Otzar” which is Hebrew for “treasury” or the “Treasury of Souls” which was believed to be in the “seventh heaven,” wherever that is. For Jews, the Guff is a term the Talmud uses to refer to the repository of all unborn souls where near the Tree of Life was the Tree of Souls that was supposed to blossom, producing new souls which would then fall into the Guf or the “Treasury of Souls” and allegedly fell upward, into the believed, “seventh heaven.” This Tree of Souls was thought to be the source of all human souls that have ever lived or will ever live, but how Adam and Eve came apart from the Tree of Souls was never explained. They believe that when the Tree of Souls is emptied, then the Messiah would come and by their belief system, even a baby that’s born brings us that much closer to the Messiah’s return. In short, the “Guf” or the “Chamber of Guf” is not at all biblical and in fact, is contrary to the biblical doctrine of being saved by grace alone by faith alone in Christ alone. The Bible doesn’t teach a “seventh heaven” but that a person can either go to hell or to heaven. There are no other options. We either have been brought to repentance and faith in Christ or we reject believing in Him but at our own peril (John 3:36b). The Talmud insists that there are a specific number of souls that are in heaven that are waiting to be born and in this heavenly repository and until they are born, the Messiah cannot return but the truth is, the Messiah has come and the Jews rejected Him. Even though the Scriptures testified of Him (John 5:39), they refused to believe that Jesus was the true Messiah and by doing so, they had rejected the One whom they had been waiting for and the only One Who could save them. We are not saved when the Guf empties but when we empty ourselves and trust in Christ. We have no other means by which we can be saved (Acts 4:12; Eph 2:8-9). The origin of the soul is not in heaven or in the Guf but in the Creator Himself. To believe that the soul is waiting to be attached to a body is contrary to the creation account of Adam and Eve. God gave them a choice; obey and live in the Garden of Eden or disobey and leave the Garden for all time. The soul didn’t originate by any other means than by the Creator God Who made man in His own image (Gen 1:27) complete with a body…not waiting for one. We are born into sin and our sins have separated us from a Holy God (Isaiah 59:2) so something had to be done. We needed a new birth…a second birth and that’s called being born again. Jesus said “Truly, truly, I say to you, unless one is born again he cannot see the kingdom of God” (John 3:3) so not only can’t you enter the kingdom of God unless you are born again, you can’t even see it! This new birth is not of the origin of man as the Apostle John wrote, “to all who did receive him, who believed in his name, he gave the right to become children of God, who were born, not of blood nor of the will of the flesh nor of the will of man, but of God” (John 1:12-13). This new birth of the soul is from above as the Greek indicates that a person is “born again” is literally “born from above” by the sovereign act and will of God. We can’t cause our new birth any more than we caused our own natural birth. It is all from God and all by God. All we must do is to be brought to repentance by God and then place our trust in Him. 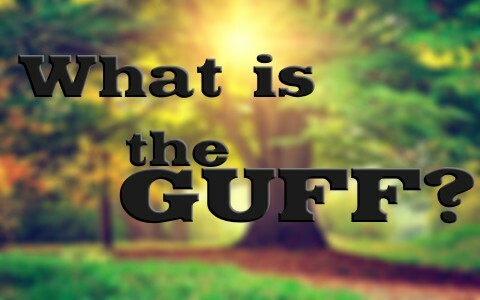 The “Guff” or “Guf” is about as unbiblical as it gets because it robs God of glory and ascribing to a tree (the Tree of Souls) to the creation of man and their bodies doesn’t come from Scriptures but from the human imagination. Bodies and souls all come from God. Besides, none of us can save ourselves and our being born does not make the Messiah’s return draw closer. Jesus as the Messiah has already come to save and to seek those who are lost and most rejected Him. Today, there is a gulf, not a Guf that separates us from God but that partition has been broken by the broken body and life of Jesus Christ. Now we can have peace with God through Jesus Christ (Rom 5:1-2) because our condemnation has been lifted (Rom 8:1) by the Son of God Who took upon Himself the wrath of God so we wouldn’t have to receive it ourselves. That’s why the gospel is called the “good news,” and in fact, it is the greatest of news for us all. Mr. Wellman by adding the word “alone” to your believed doctrine of salvation (“by grace alone by faith alone in Christ alone) you have added to the teaching of Scripture. Not to mention the fact that by grace alone excludes by faith alone. I believe in the simple truth of Scripture and what it teaches. The Bible also does not teach that we are “born into sin” – we are born innocent and then choose to sin at that point in time when we know the difference between right and wrong and openly defy God. Paul in his letter to Rome says that it is grace that saves us, but not grace alone. God’s grace is the way of salvation. Paul clearly states that no one deserves or can earn their salvation, in Romans chapter 4 he explains faith [faith = the who of salvation]. “Therefore it is of faith that it may be according to grace…” (Rom. 4:16). Faith may be defined as “Believing what God said enough TO DO what God said” (cf. James 2:20ff; Rom. 11:19-23; Heb. 3:18-19 do not obey = disbelief). In 2 Thess. 1:3ff Paul explains what is to become of all “who do not obey the gospel of our Lord Jesus Christ” (vs. 8). The gospel being the death, burial, and resurrection of our Lord [at the core] 1 Corinthians 15:1-3, but how do you obey this w/out having to physically die, be buried, and resurrected as was Jesus. Paul explains in Romans 6:3-7. The apostle Peter, using the “keys to the kingdom” in Acts 2 told the believe Jews to “repent and be immersed unto the forgiveness of your sins” (Acts 2:38). Amen sir. Well put. Paul said it all: “8For by grace you have been saved through faith. And this is not your own doing; it is the gift of God, 9not a result of works, so that no one may boast” (Eph 2:8-9). You were gracious and gave Mr Heath a pass. Unfortunately he holds the popular belief that we are not sinners by nature. This notion flies in the face of Scripture. We are sinners not because of what we do, but because of who we are. We continue to sin as we age because of this nature, not because we learn to sin, but because we are by nature sinners. We all are damned because of the fallen nature we have inherited from Adam. Christ came to rescue us from this curse. Nice catch Doc. I missed the part where he said that there we are not born into sin because the Scriptures are clear about this. I would agree that Got Questions gives a great Scriptural basis for this fact and we wrote elsewhere about this at: http://www.whatchristianswanttoknow.com/what-is-the-original-sin-a-bible-study/ Thank you for standing on the truth. I know my question is not unique. But I must clarify for my self. When God was helping soldiers win wars and the favoritism her showed David after David committed Murder and won the prize of the dead mans wife; How could a just God do this? Is there clarification on the many things in the Bible that can lead to answers that can be truly understood in a logical manor. Our minds and hearts are very good at discerning, so we must be given truth or method of understanding what the greater meaning is in many verses? Hello Bonnie. A God that I could explain would not be God at all. His ways are past finding out. We must trust Him. God gives the vivid details of all the heroes of the faith, warts and all, but I believe that gives the rest of us the assurance that God can forgive any sin. David paid dearly for his sins because his sons were a constant threat to him, often being on the run from his own sons who overthrew the throne. David had very bad consequences. Read what happens in David’s life in 1 Kings or 1 Chronicles.